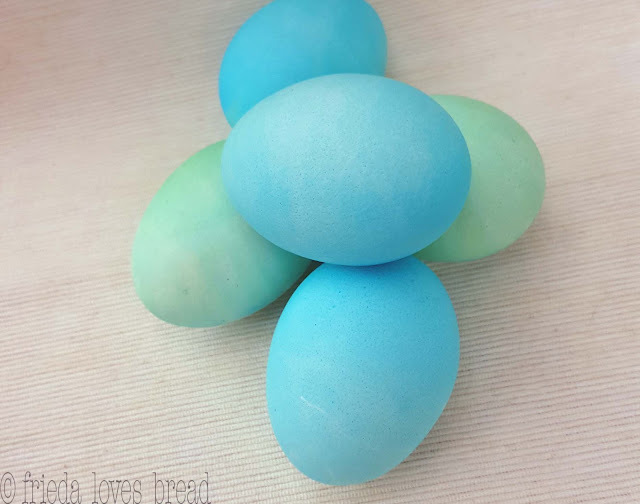 Frieda Loves Bread: 5 Tips for Perfectly Dyed Easter Eggs! Use Your Pressure Cooker, too! 0 5 Tips for Perfectly Dyed Easter Eggs! Use Your Pressure Cooker, too! 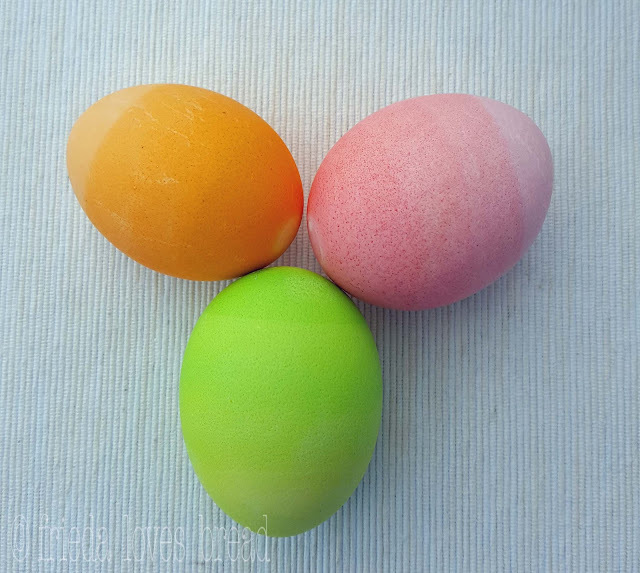 Take a look at these bright, beautiful, & colorful dyed hard boiled Easter eggs! Begin with a perfectly hard boiled egg, quickly dip it into the prepared color and enjoy the results! Most dyed egg methods have you put the egg into the prepared solution for 5 minutes... this only took seconds to color! These beautiful blue and green eggs only took seconds to color. I put only 5 drops of liquid food color dye and vinegar into my water prior to cooking my eggs in my Instant Pot pressure cooker. 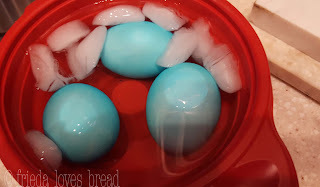 After cooking the eggs, they were immediately put into the dye, and then into an ice water bath. No color loss occurred while in the ice water bath! If you want to naturally dye your eggs, take a look at this great article from Your Homebased Mom! You can try using your pressure cooker for making natural food dyes: cook beets, yellow or red onion skins, blueberries, paprika, tumeric or red cabbage in 1-2 cups of water, HIGH pressure for 5 minutes. Use HOT water. Even though most food dyes work with cold or warm water, you will get deeper, brighter colors when using hot water. The hotter the water, the less time it will take to color your egg. Add white vinegar to your hot water. 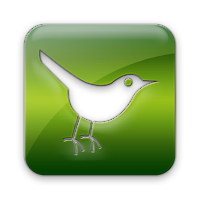 This will allow your color to bind (stick) to the egg. Most food dyes are acid dyes and only work in acid conditions. The vinegar creates a chemical reaction with the calcium of the egg shell and helps the color absorb better, resulting in a darker, brighter, more intense color. I experimented with some new Neon Gel colors, which worked really well for marbled and blocked eggs. Marbled Eggs use oil or melted margarine. Put a small drop of oil into the prepared dye solution. Stir well. With tongs or slotted spoon, dunk the egg in/out of the solution 3-4 times, or until desired swirl effect is achieved. Remove egg onto wire cooling rack to dry completely. 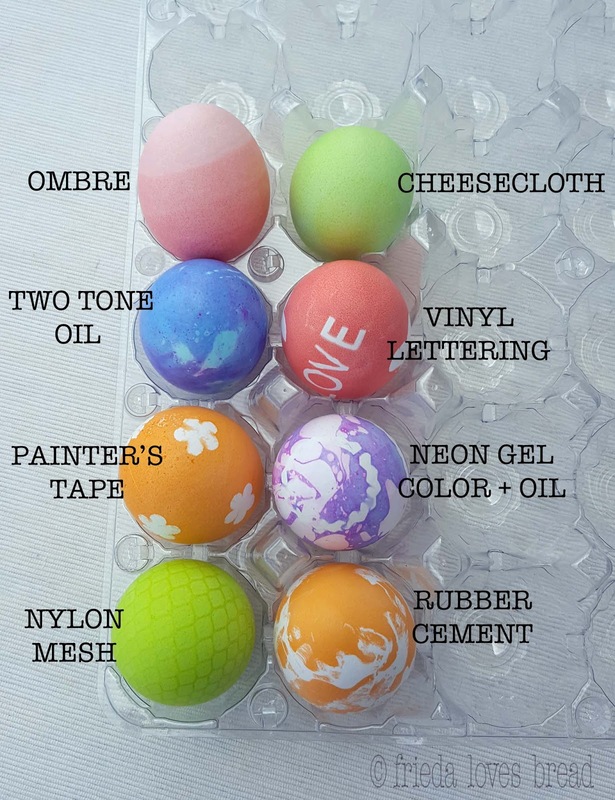 Remove oil from colored egg with a clean paper towel. 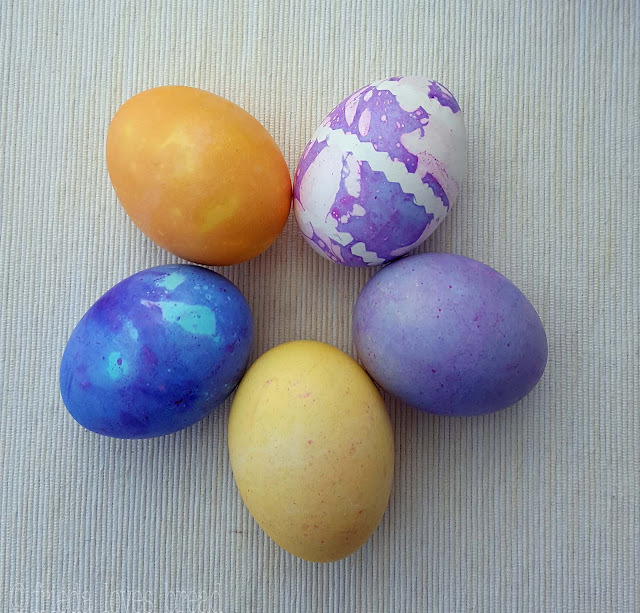 Two-toned Marbled Eggs: Dye eggs a single, solid color, with no oil. I used yellow and blue for the base color. For the second color, choose a color that is darker and add your oil. I used orange (for the yellow) and purple (for the blue) eggs. Swirl the oil around. Dunk the egg into the oil/color mixture. Remove and place on a wire cooling rack to dry. When dry, wipe off oil with a paper towel. Rubber Cement: This method was the messiest and took the longest, as the rubber cement needs to dry completely before cooking your egg or coloring it. Then, after the colored egg has dried, the cement needs to be gently rubbed off. The oil marbleized eggs were much easier. Use silicone tipped tongs, a slotted spoon, or small metal strainer to remove the eggs. Put a paper towel under a wire cooling rack and place the colored eggs on the rack to dry. Blocked Eggs use fabric, vinyl stickers, electricians tape or painters tape on clean eggs to block the dye from penetrating the eggs. Painter's tape worked much better, in my opinion. These blocked eggs below used nylon mesh from a loofah found at the dollar store. Don't they look like dinosaur eggs? Try different open weave fabrics, such as lace, to create intricate designs. I tried cheesecloth, but the weave was too tight to show any patterns. 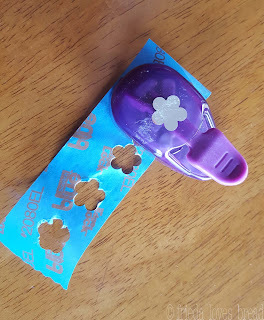 Secure the fabric in place with a paper twist tie. 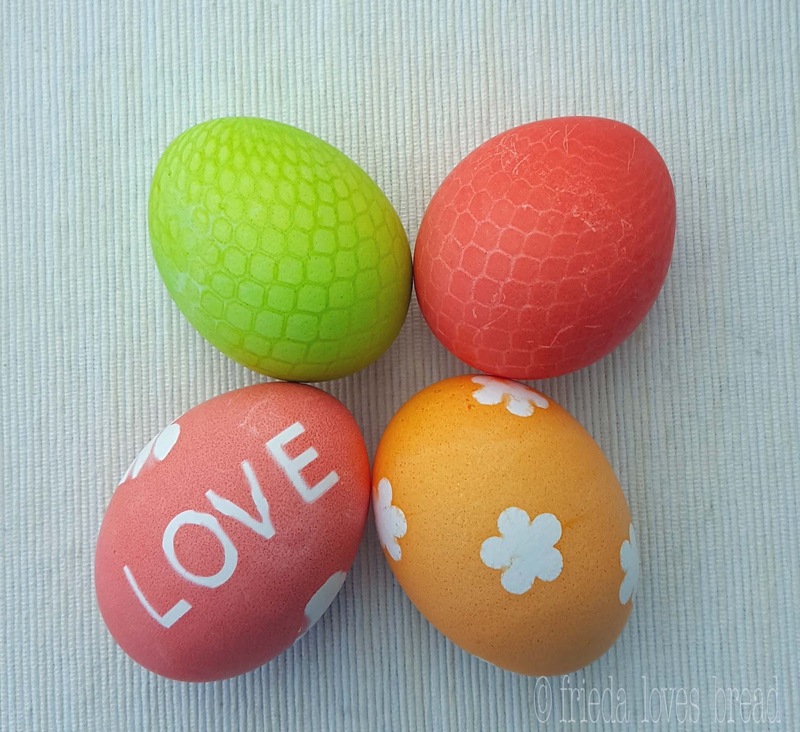 I used vinyl letter stickers for the word LOVE and used a flower craft punch with painter's tape for the eggs above. Washi tape will also work for color blocking. You can put these stickers, tape, and fabrics on raw eggs and put them in the pressure cooker. They won't fall off. Then they are ready to dunk and color. When eggs are dry, put them into a bowl or egg carton in the fridge until ready to enjoy, up to 1 week. Do not allow cooked eggs to stay at room temperature for more than 2 hours. I used Neon Gel colors with the orange and green eggs and liquid food coloring for the rose colored egg. I used 1 teaspoon of gel coloring for each cup of vinegar water, which is a LOT, but it achieved the colors I wanted. 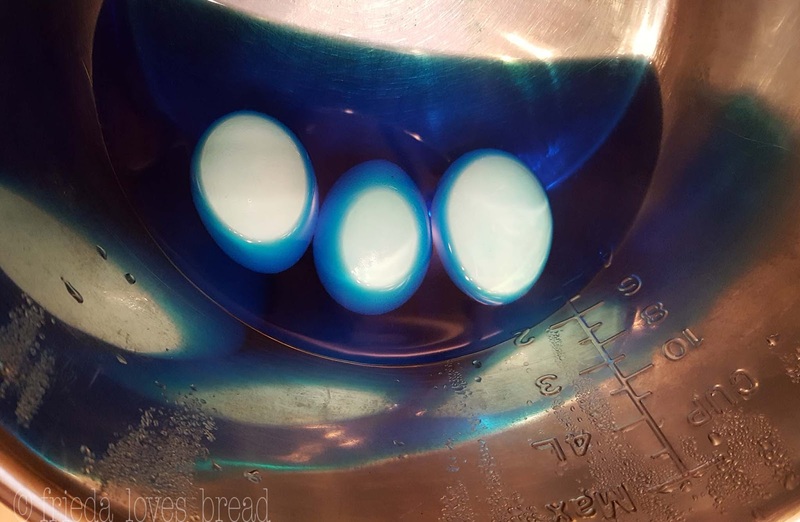 4-3-2-1 Ombre eggs are very easy to make! 1. Put a small metal washer into a flat bottom glass jar. I used a 8 ounce jelly/canning jar. 2. Set the cooked egg on top of the metal washer. 3. Slowly pour the HOT prepared egg color carefully inside of the glass, down the side, until the bottom 1/4 of the egg is covered. 4. Slowly pour CLEAN, clear water down the side of the glass, until half the egg is covered. 5. 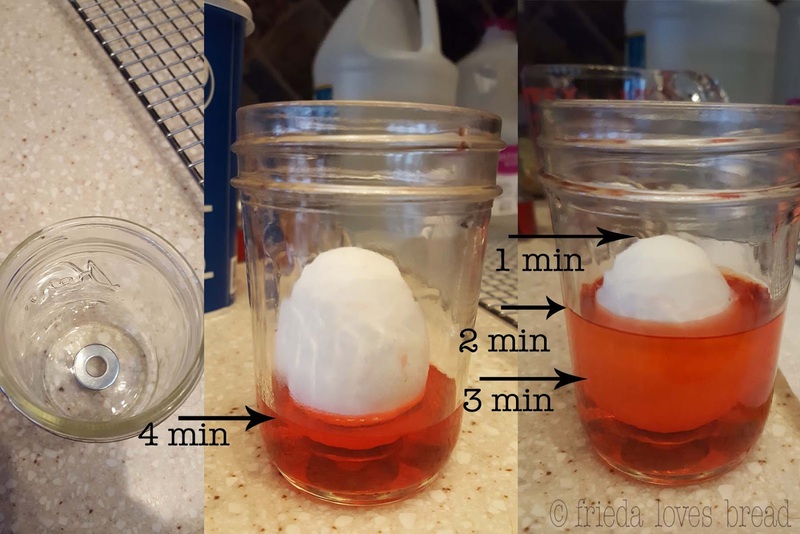 Slowly pour clean, water into the jar, until 3/4 of the egg is covered. 6. Pour the rest of the water down the side of the jar, until the entire egg is covered. Don't worry if the egg falls over on its side. Learn the secrets to FAST & BRIGHT coloring of eggs, with simple and fun marbled, blocking and ombre designs. 1. Prepare eggs by using fabric, tape, or vinyl letters to create designs. Smooth out any bubbles or wrinkles.2. In small glass bowl, combine HOT water, vinegar, and desired food coloring. *This can be added to your pressure cooker before cooking your eggs. Place trivet over water and set eggs on top. After cooking eggs, proceed to next step).3. Using a slotted spoon, tongs or small strainer, dunk the prepared eggs into the dye solution, making sure the entire egg is covered. 4. 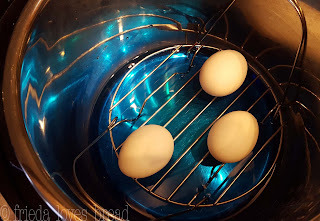 Remove the egg and set it on a wire cooling rack with paper towel under the rack. *Cool hot, colored pressure cooked eggs in a ice water bath for 10-15 minutes.5. Put dry colored eggs into a container or egg carton and store in the fridge until ready to use, up to one week. Marbled Eggs: Add cooking oil to prepared dye. Stir. Using a slotted spoon/tongs, dunk egg 3-4 times. Place on wire cooling rack until dry. Use paper towel to remove oil from egg. 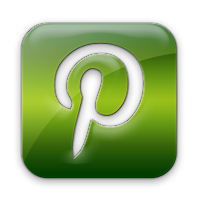 Ombre: Put a small metal washer into a flat bottom glass or jar. Place egg on top of metal washer. Slowly pour HOT prepared dye down the side & into the glass jar, until 1/4 of the egg is covered. Wait 4 minutes. Slowly pour CLEAN, clear water down the side, into the jar, until half the egg is covered. Wait 3 minutes. Repeat, covering 3/4 of the egg. Wait 2 minutes. Repeat, covering the entire egg. Wait 1 minute. 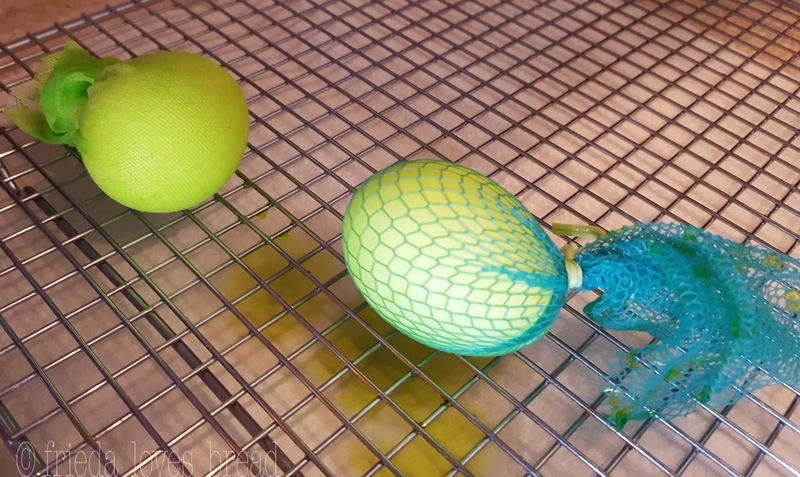 Remove egg from dye, place on wire cooling rack and allow to dry.